There has been a few changes to stops on the food tour due to venues closing and new ones opening. It was sad to see the Highland Chocolatier shop closing, but you can still buy their lovely chocolate online. 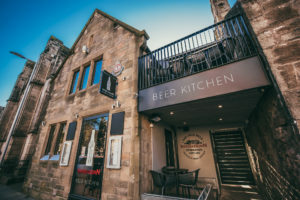 But as one door closes another opens and we now stop at the newly opened Beer kitchen for Haggis doughnuts and popcorn mussels. Forgans our previous haggis stop now provide dessert, Cranachan a traditonal Scottish dessert . As cheese has gone from the menu at the excellent St Andrews Brewpub we have had to seek out a new venue for cheese & beer tasting so now have a great stop right next to the 18th green of the Old Course called Ham’s Hame. I would like to flag up the Crail Festival with over 40 events over 10 days running from the 10-29th July. Also running from end of June through nearly the whole of July is the Byre in the Botanics offering a range of music, theatre and movies in the Gardens but there is covered seating. Dates for your diary are graduation ceremonies for St Andrews Universtiy run 20th-23rd June so restuarants and bars in the area will be extra busy. First Saturday of every month there is a farmers market in St Andrews 9am-1pm. There will be a hidden gardens of St Andrews open day on Sunday 25th June 11am -5pm.